George H Bush was the 41st President of the United States who served in office from January 20, 1989 – January 20, 1993. What was the life of George H Bush like? The short biography of President George H Bush covers important information and facts about his early life, his family, career and the famous events and achievements of his political life. 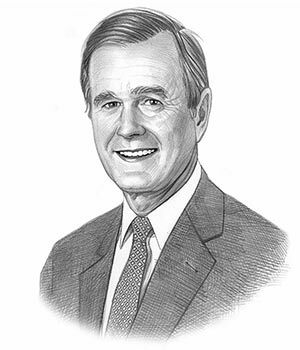 Our short biography of George H Bush provides an interesting and easy way to learn about the life of the President. The following important facts provide a fast overview of important facts about President George H Bush. Facts and Info: George H. Bush was the 41st president of America whose term saw the collapse of the Soviet Union and the end of the Cold War. He also led the U.S. in the 1991 Gulf War against Iraq. For additional info refer to 20 Facts about George H Bush. Facts and Info: George Herbert Walker Bush was born on June 12, 1924 in Milton, Massachusetts. His family moved to Texas when he was only two so he considers himself a Texan. He came from a wealthy family and his father, Prescott Sheldon Bush, was a successful investment banker. George H. Bush had a range of government positions prior to becoming president including U.S. Ambassador to the United Nations & Director of the CIA. Facts and Info: The career of George H. Bush included the roles of Businessman, Politician and Statesman. He received and excellent education and attended Yale University. He served in the Navy during World War II and became the youngest pilot in the Navy. After the war he worked in the oil industry, eventually forming an oil development company. He became the 41st President of America in 1989 and served for 4 years until 1993. Facts and Info: George H. Bush married Barbara Pierce Bush on January 6, 1945. He met and married Laura within a three-month time span. They had 5 children named George W, Robin, John, Marvin and Dorothy. Their son George was destined to follow in his father’s footsteps to become the 43rd President of America. Facts and Info: George H. Bush came into the presidency as one of the most qualified candidates to assume the office supporting the Republican Political Party. He was 64 years old when he was inaugurated as the 41st president. Inauguration is a President's swearing-in ceremony. Dan Quayle stood as the Vice President. For additional facts refer to his Presidential Cabinet members. Short Biography of George H Bush: What he was like! Facts and Info: George H. Bush is an imposing figure standing at 6 feet 2 inches and weighs approximately 195 lbs. He has straight brown hair streaked with gray, blue eyes and a fair complexion. His lanky physique earned him the nickname 'Skin'. Whilst at Yale he was accepted into the Skull and Bones secret society which some people believe help members to make connections with influential people and families to boost their careers. His other nicknames include “Bush 41” or Bush the Elder which distinguish him from his son. Facts and Info: During his lifetime he played a key role in important events of the era. His presidency saw the successful invasion of Panama after Noriega, the leader of Panama, declared a state of war with the U.S. The Exxon Valdez oil spill that contaminated about 1,300 miles of coastline in Alaska. The world then witnessed the end of the Cold War & the break up of the Soviet Union. The Persian Gulf War led by the United States freed Kuwait from Iraqi invaders. Facts and Info: During his life George H. Bush suffered from depression, arthritis, glaucoma and ulcers. About 20 million Americans develop at least one stomach ulcer during their lifetime. Stress does not cause an ulcer, but it may be a contributing factor. The short biography of George H Bush provides a fast overview of the key facts and events about his life and the accomplishments of his presidential term in office. The following George H Bush video enables you to sit back and listen to the history of his personal and political life - a useful educational resource for kids, children and schools learning about the life of President George H Bush.